Tonight at 730pm, award winning poet and publisher J.P. Dancing Bear will read from his new collection of poetry, Inner Cities of Gulls (Salmon Poetry) at the Artists Union Gallery 330 S. California St. Ventura, CA. 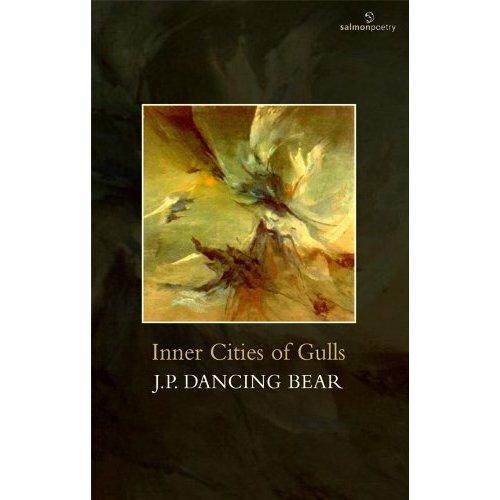 J. P. Dancing Bear is widely published: his poems have appeared in over a thousand publications including Shenandoah, Mississippi Review, Cimarron Review, Poetry East, North American Review, Atlanta Review, Verse Daily, Poetry International, Marlboro Review, Hotel Amerika, Seattle Review, Permafrost, Controlled Burn, Cranky, Rattle, and Slipstream. His chapbooks include What Language, winner of the 2002 Slipstream Prize and three full-length poetry collections: Billy Last Crow (Turning Point, 2004); Conflicted Light (Salmon Poetry, 2008); and Inner Cities of Gulls (Salmon Poetry, 2010). A resident of the Santa Cruz/Monetery Bay Area of California, he is the host of “Out of Our Minds” a local weekly radio show for public radio station KKUP featuring some of today’s best contemporary poets. He is the editor of The American Poetry Journal and the owner of Dream Horse Press, which publishes the Orphic Prize and APJ Book Prize series. An open mic follows the featured reading. I will be there tonight reading from my new poetry collection Middle of the Night Poems From Daughter to Mother :: Mother to Son (en theos press 2010) and some of my students will be there reading too. Join us to listen or to read your own work!